We are a group of artists committed to positive and revolutionary change in response to the 2016 U.S. presidential election. Using our unique and diverse artistic voices, we create original theatre and art, and donate all proceeds from our events to charitable organizations dedicated to bringing social justice to the world. The FEAR Project is a play and theatrical action based on interviews about fear. The theatrical experience includes pre-show interviews and a post-show discussion with the audience centering around the exploration of 13 specific questions. The FEAR Project aspires to create an atmosphere of restoration by giving people a chance to communicate about fear in a safe and creative space. The FEAR Project has been produced in The Czech Republic, India, Wisconsin and New York City. Each time it is re-created from scratch. The next stage of the journey is to bring the project to Los Angeles, in collaboration with Jessica Litwak, The HEAT collective and ARULA, to build the experience from the first question: What are you afraid of? If you need further assistance, please contact heidi@artistsriseupla.com or call 323-702-3628. A compilation of favorite pieces of music from some of ARULA’s most beloved performers singing songs of hope, inspiration, social change, and humor. Featuring: Chrissie Fit, Jenna Lea Rosen, Benai Boyd, Amy Keys, Hannah Nordberg, Heidi Godt, Jennifer Kumiyama, Joseph Silva, Julia Gregory, Laura Coyle, Matt Davis, Robert Yacko, Bryan Johnson, Suzanne Slade, Will Martinez and more! The entire ARULA production team want to thank all the artists involved in making this one of our best events yet! An Afternoon of Spoken Word and Performance. The East Los Angeles Women’s Center's mission is to ensure that all women, girls and their families live in a place of safety, health, and personal well-being, free from violence and abuse, with equal access to necessary health services and social support, with an emphasis on Latino communities. Thank you to all the artists and activists shared their powerful voices! The first annual ARULA Short Film Festival showcased a variety of the best politically-themed short films from around the world. The festival took place on Wednesday evening, November 8 at the Downtown Independent Theatre located in downtown Los Angeles. A moderated Q and A with the filmmakers followed the screening and then a catered after-party in the theatre lobby was enjoyed by all. All proceeds were donated to Planned Parenthood. Thank you to all who came out for a revolutionary night of film and support bringing activism to the screen! On April 18th, 2017, ARTISTS RISE UP LOS ANGELES produced a night of music and comedy, to benefit the Southern Poverty Law Center. Many talented artists took the stage, including the evening’s headliner, “the Liberal Redneck,” Trae Crowder. Transparency, Taxes & Tweets celebrated the union of actors, comedians, musicians and dancers, and the laughter that emanated from the audience was a welcome respite from the current political climate. 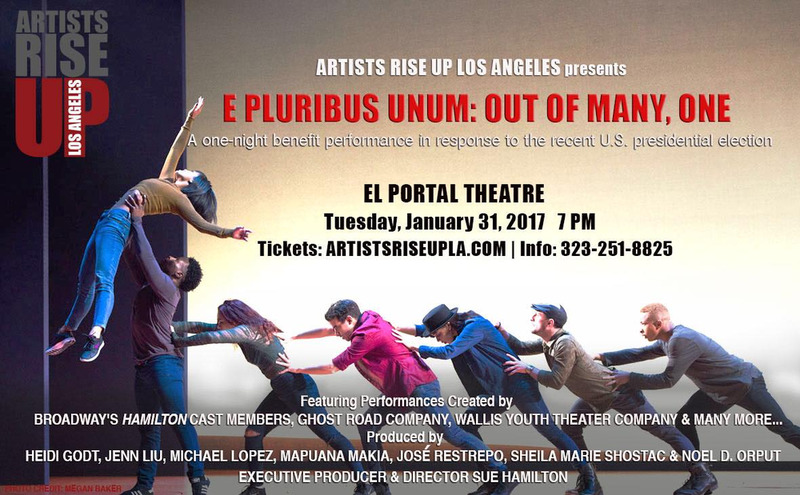 ARTISTS RISE UP LOS ANGELES - "E PLURIBUS UNUM: OUT OF MANY ONE"